Also, welcome to my first post where I try all free games from PS Plus, play it for a little bit and see if they are any good! 😀 Basically, this is a first impressions for every each game in July 2018. This month Playstation gave us 4 games, 2 of them being indie. The “mainstream” video games are Heavy Rain and Absolver, while the indie ones are Extreme Exorcism and Space Overlords. I’ve talked about Heavy Rain before. You can see the full review here. However, for the purpose of this post, let me give you a small intel in what the game is and how good the game is. 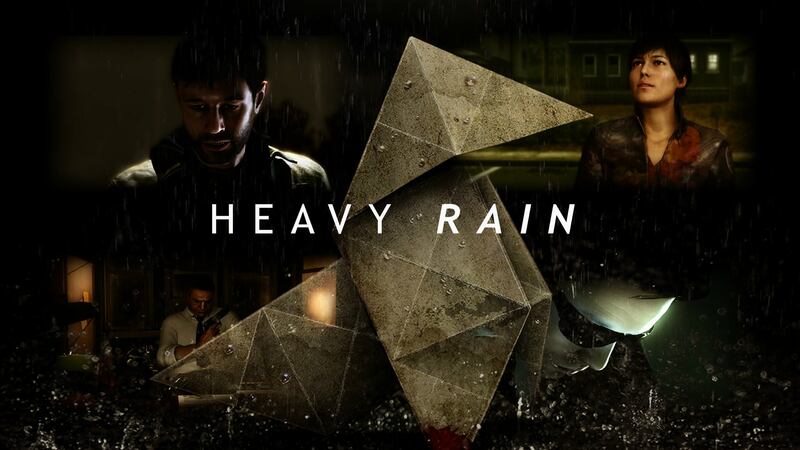 Heavy Rain is an interactive drama and action-adventure game. This way, the game is more focused in you making choices rather than actual gameplay. Nevertheless, you do have many scenes where you need to press different buttons, in different ways to get pass some parts. To be honest, the gameplay is pretty fun. 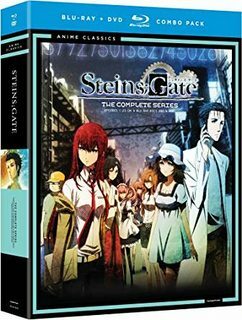 Basically, it’s one of those games that is just like seeing a movie, but you are the one controlling the characters and pulling the shots. I’ve already bought this game before and played it fully and I can say the story is REALLY good! They went for a drama/suspense kind of vibe and they do it extremely well. This one is a must download! The game is great and a lot of fun, interesting and intriguing. One of those games that you just want to play it all in one seat to see the story developing. 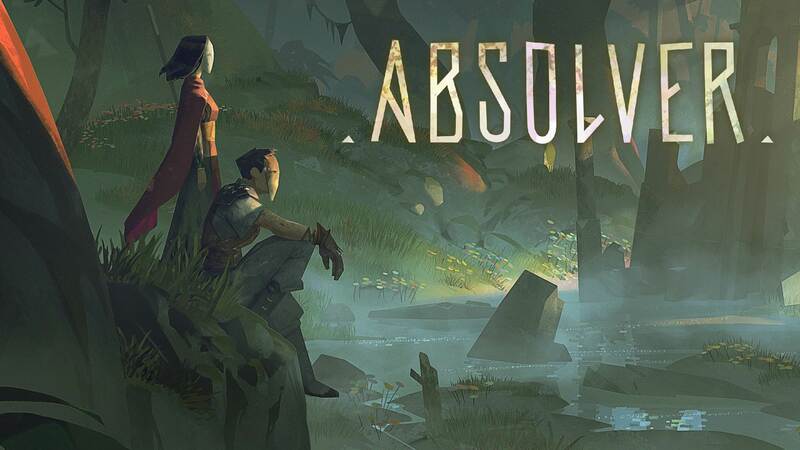 Absolver is an online multiplayer combat game. Now, I’ve tried to play this game… I really did, but it’s way too difficult for a combat newbie as myself. The game let’s you choose 3 types of combat, all of them with different difficulties. Then, you go to the tutorial and there is way too much controls and stances to remember and learn. The moment you pass the tutorial you are in the game and let me tell you, the tutorial does not prepare you to the multiplayer. I was able to find a guy and play a little bit with him. We both tried to fight one of the first bosses and, of course, I ended up dying pretty quickly. One thing that I loved about the game though, was the environment and world building. Although the game can be seen as a more of a mainstream one, the game has that kind of indie vibe that we all end up loving. In conclusion, if love combat games and have some kind of experience with difficult combat systems, this may be your game and I suggest you to download it and see how it goes. If not, probably you will just rage quit and stop the game pretty quickly as I did. If you want to enter the combat type of video games, you better start with some simpler ones. The first indie game! I didn’t know what to expect from this one! I knew it was an arcade kind of game and I knew that I would love just because of that! Nostalgia lvl 9000. 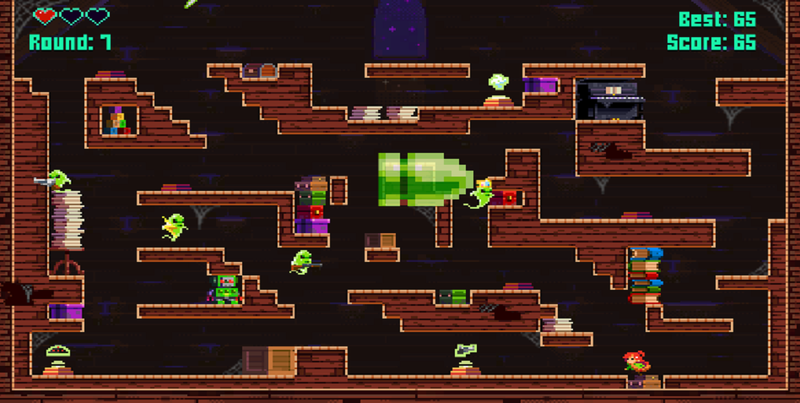 The game as some levels in the arcade (6-7). However inside those levels you also have more or less 5 levels. Basically each main level is a part of the haunted house. Let’s say the library. If you unlock the second level of library, the set will be the same, but the map will be different (and more difficult). Moreover, you still have challenge mode and deadmatch. In the end, this is a game that will give a lot of hours of fun (if you want to do it all). I also love the ambience and the graphics. It’s clearly arcade, but with a little twitch of more updated graphics. Also, love the music! It’s spooky, but at the same uplifting and has a nice beat! Last, but not the least, you have a lot of different weapons to use (and to unlock) making it even funnier to play AND it’s possible to play with other 3 friends offline. Meaning, this game is perfect for inviting friends and pass a nice afternoon. Hmmm… How can I put this… Space Overlords comes as an action (?) 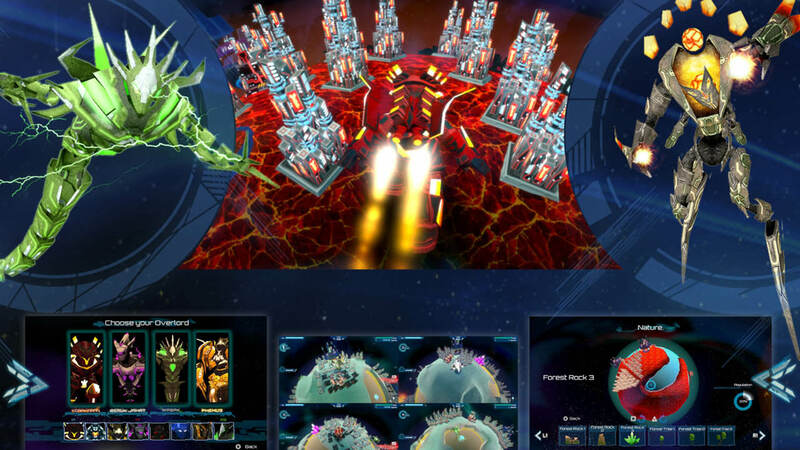 game where you play an Overlord who, by some reason, is destroying the crap out of several different worlds and galaxies. Seems interesting? Yeah, it does… But the game is not that good. You start with 4 overlords that you can choose. However, from what I’ve seen, you can then unlock other ones later. It also features multiplayer (which is awesome) to play with your friends offline. I’ve also seen like community worlds. 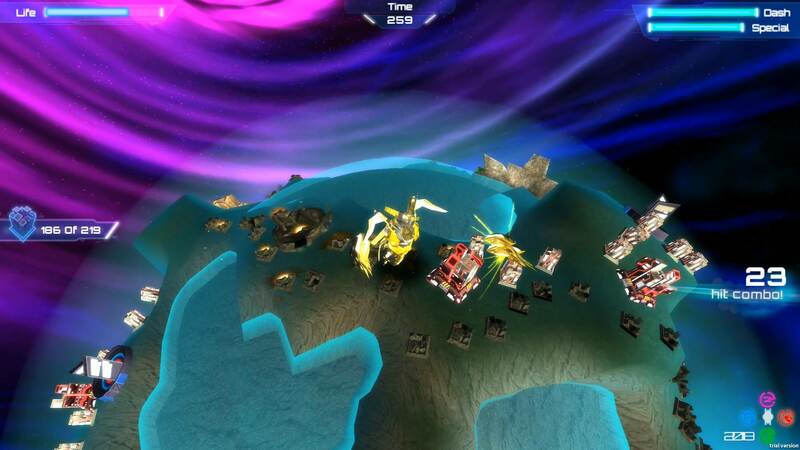 It seems you can create your own galaxies and then share them with other players for them to play. However, don’t ask me about that because, for some reason, the “loading” menu didn’t really go off and, therefore, I couldn’t see any galaxies from other people. Now, if Absolver is a difficult, done to the detail, action game, Space Overlords is a “smash all buttons and pray that it works” kind of action game. The problem is not really with the objectives in themselves, but the problems the gameplay has. Circle and Square are suppose to be normal attacks… However, most of the time they do not hit the target. I’ve played the game for half an hour and I called it done. The game is way too difficult, not because of the game itself, but because of all the problems inherent to the gameplay. You are getting stuck all the time, can’t really destroy enemies without taking a bunch of damage… Well, I think you can see the deal. Moreover, the game seems to be way too repetitive. Although, destroying a bunch of buildings just by running over them seem pretty fun, it certainly starts to feel old after a one hour or two. So, this is a big NO. Even if you like robots… Even if you like action games… Even if you like to smash buttons and destroy random things… I’m pretty sure there are way better games out there than this one. So, nope. Don’t bother downloading this one. I think July was a good month for PS Plus users. Not great, but good. Heavy Rain is without a doubt a must play and should be in everyone’s playlist and Extreme Exorcist just seems way too much fun to just pass it by without giving it a go. Absolver is, probably a good game, I don’t really know. I think they went with a game that is way too specific for one type of gamers. Nevertheless, if difficult action games is your thing then it’s just a nice game to add to your library. 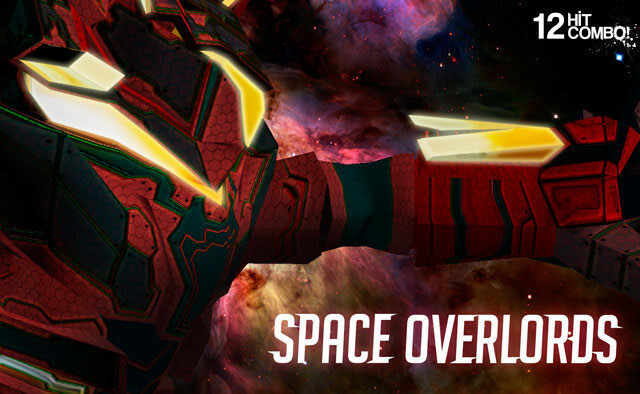 Space Overlords is a flop… There is no other way to put it! If you are able to bore me in half an hour of gameplay (when I really am trying to play it) then you just did something terribly wrong. And you? What do you think of the free games in PS Plus for this month? Have you tried them? 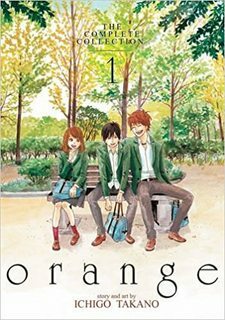 Have you liked it? Tell me everything in the comments! Next postMel&Arthis Appreciating the Fine Men From the Anime World | Video Game Hotties! 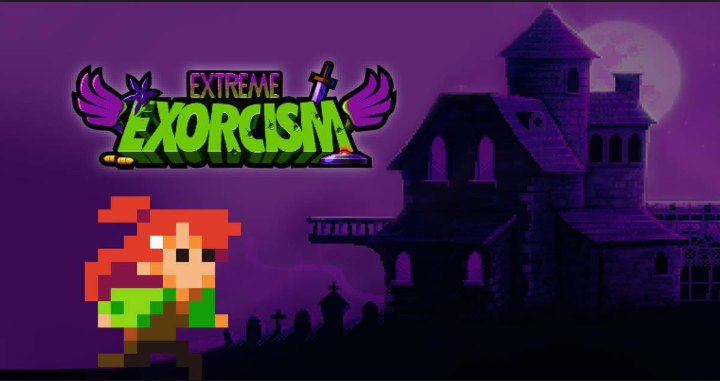 The exorcism game sounds interesting. 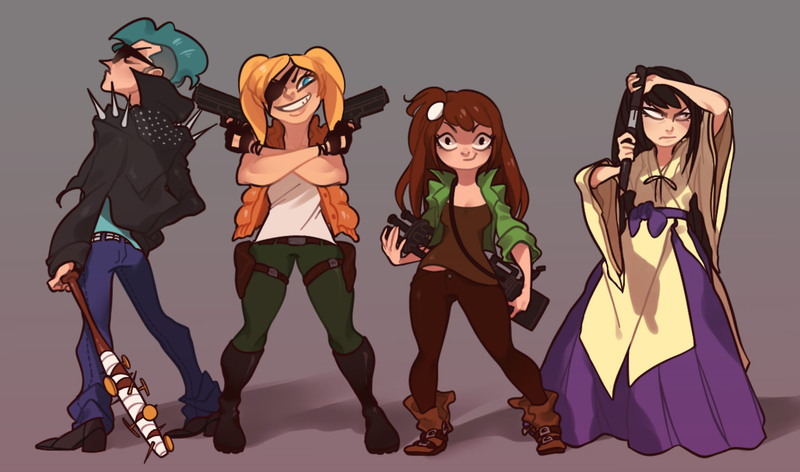 The “ghost” of your character mechanic reminds me of Super Time Force, which I enjoyed quite a bit. I may go and give that a try. I’ll set it to download sometime this week! Heavy Rain was the only game I cared about. I know that people really hate David Cage games but I LOVE them. I tried Absolver too and man that game was just not good. As somebody who is adept when it comes to combat games, this one felt clunky and not very fun. Well… Glad that it was not only because I was newbie when it comes to combat games ahah The games does feel not fun at all! Some of the hate he gets is about stuff he did in real life but the game complaints are because his writing is silly but that doesn’t have to be a bad thing. Aaaaa heavy rain, such a great game! I don’t have ps plus anymore, had it when I still owned a ps3 but now that I have a ps4 I frankly refuse because Soy is literally forcing the Plus subscription on people in order to play online multiplayer games.